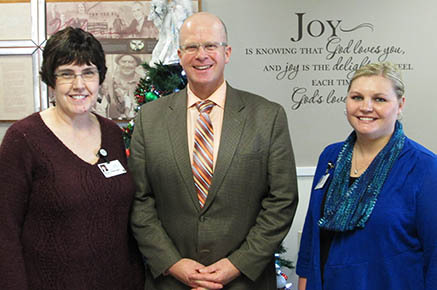 SPECIAL GUEST — Heath Boddy (center), president and CEO of the Nebraska Health Care Association, visited at Good Samaritan Society with Karen Glesinger, left, administrator, and Jessica Donner, right, director of nursing. Heath Boddy, president and CEO of the Nebraska Health Care Association, visited Good Samaritan Society of Albion last Tuesday, Dec. 12. Albion was one of several stops he made while visiting rural Nebraska healthcare providers last week. 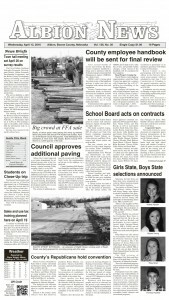 Boddy said he was impressed with the Good Samaritan facilities and staff in Albion. He noted that Medicaid makes up a significant portion of the state budget, and is the main payer of long-term care services needed by Nebraskans. “We are paying very close attention to Medicaid, because any cut would have a major impact on vulnerable Nebraskans,” Boddy said. One of the concerns of the Nebraska Health Care Association is that small rural skilled nursing centers, relying in large part on Medicaid, are experiencing significant business challenges.